NASHVILLE, TENNESSEE – Bandit Lites, the world’s leader in concert lighting, has made another substantial investment in new gear with a large purchase of Ayrton fixtures, including Ghibli™ and Mistrals. Both fixtures will initially be utilized on the road for platinum selling recording artist Chris Young’s Raised on Country Tour with a lighting design by Chris Lisle and Mike Stanley, as well as on Lighting Designer Steve Hoover’s rig for legendary musician Jimmy Buffett’s Son of a Son of Sailor Tour. The Ghibli is Ayrton’s LED spot that comes factory-equipped with a framing system and delivers 23,000 lumens in a highly compact format along with a wide selection of colors and gobos, giving lighting designers a massive selection of tools to utilize. 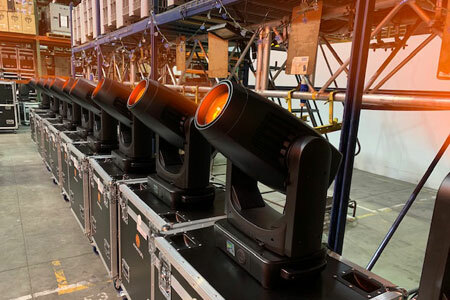 In addition to the shipment of Ghibli fixtures, Bandit Lites also purchased a large quantity of Mistrals, a versatile spot luminaire which features an ultra-compact body while still offering a 13-lense optical system that gives a wide zoom range and unformal flat beam no matter the angle.